The Yukon is a great place for sport fishing, and no species is more highly prized than Yukon salmon. In 1998, after public consultation and discussion with Yukon anglers, the Salmon Sub-Committee recommended to the Minister of Fisheries and Oceans that anglers wishing to fish for wild salmon be required to purchase a Salmon Conservation Catch Card. As of the 1999 season, new regulations came into effect that allows sport anglers to share in the responsibility and reap the benefits of a healthy salmon harvest. In addition to obtaining a Yukon Sport Fishing License, sport salmon anglers must purchase a Salmon Conservation Catch Card. Anglers must have the card in their possession while angling for salmon, and must keep the card up to date with all required information. The Salmon Conservation Catch Card provides a cost-effective method of assessing the annual sport harvest of salmon. Any revenues in excess of operating costs will be used by the Salmon Sub-Committee to fund salmon management and enhancement programs that are not already being funded by the federal government. These changes to the Yukon Territory Fishery Regulations came about as a result of input the SSC received from the public during consultations. 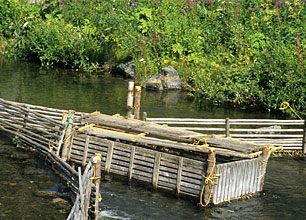 During the 2001 season, the Salmon Sub-Committee ran a Responsible Fishing for Youth contest, with funds generated from the Salmon Conservation Catch Card. Students from schools across the Yukon submitted their pictures and essays.